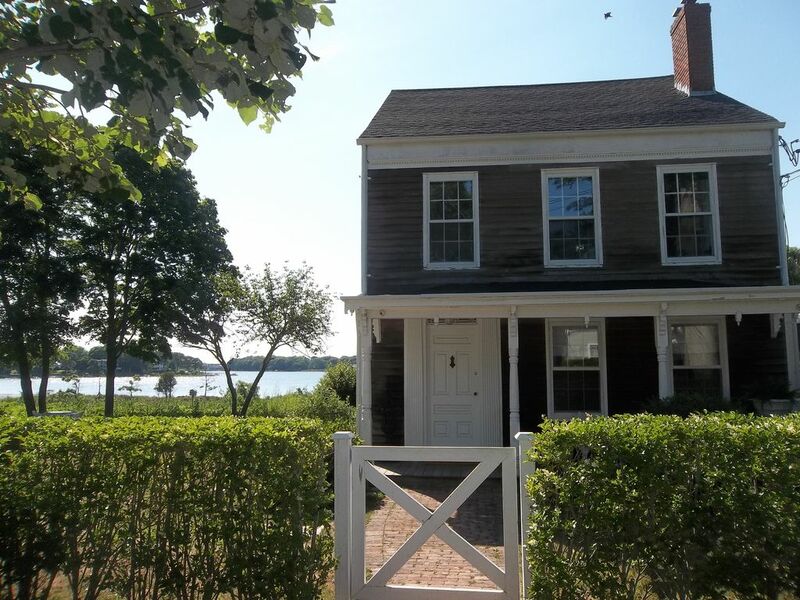 If you do not see the booking availability desired, look at my other postings of Whaling Captain's Pierson's Apartment TOO and Whaling Captain Pierson's Cottage. Or, if your party is larger than one apartment can accommodate consider booking both apartments and the cottage. Whaling Captain Pierson's Apartment is on Captain’s Row within the main house on the second floor. The property is surrounded by nature and the apartment overlooks the cove and has views of Otter pond. The apartment’s antique furnishings reflect both a classical and whimsical ever evolving sensibility without feeling stuffy or old. The apartment is a duplex with one queen size bed on the lower level. The upper level has one double size bed and two single size beds. The stairs to the upper level is not so easily navigated by the very young or very old. Window AC units will provide cooling during the summer and cast iron radiators provide heating in the winter. The apartment has one full bathroom on the lower level. The kitchen consists of stainless steel appliances of a dishwasher, refrigerator and range with a washer and dryer right off the kitchen. The apartment has a private deck and the property a private beach, expansive grounds and abundant parking. During the months of October through May of the following year, this apartment will be available as a one level, 1 bedroom apartment. The apartment is ideal for either a family or for allowing privacy to loving couples, the single visitor or the various types of creative and performing artists who are looking for a haven to relax and/or create. Experience the apartment’s environment or just be part of its inspiring, healing, spirit and soul uplifting surroundings. Sag Harbor is a vibrant year-round village with plenty of activities both cultural and family oriented alike. There is a movie cinema, a performing arts theater, gyms and spas, yoga studios, art exhibits, festivals and parades which occur throughout the year. There is also a variety of antique, clothing and novelty shops as well as many restaurants, bars and beaches. The apartment contains the amenities of wireless Internet access, TV, cable TV, a dishwasher, microwave, coffee maker, blender, a washer and dryer, iron and ironing board and towels. It offers serenity and the beauty of nature. The proximity to the Village, beach access and the sunsets. The is a deck. Also, there is a separate a sun porch. Great location! Perfect place to watch the sunset from the balcony. The town is wonderful. Great bike riding. You will really enjoy your time spent here. This is a great apartment and perfect location to town. It was a nice, easy walk to town for dinner and shopping. It has a fabulous view and a nice yard. Paris is a fabulous host. My associate and I were visiting the area for work and loved this rental. The beds were comfortable, all linens were clean, and the kitchen was equipped with all necessities. The hosts were incredibly responsive and quick to take care of all our needs. The Neighbourhood felt very safe, and was a 10 minute walk to local attractions. Would recommend this space to anyone, and will happily stay again! Everything was superb and my husband and I are already planning our return next year. The position is excellent for exploring Sag Harbour with a pretty walk to the town and with plenty of parking outside we could avoid the traffic to get out of town quickly to go elsewhere. Our one bedroom part of the house was spacious with a beautiful view over the water and all amenities we needed , fully appointed kitchen,laundry, iron and ironing board etc. The insect screens over the windows meant that we had plenty of airflow through the open windows and didn’t have to use air conditioning which we loved. Very attractively furnished with pretty antiques. The hosts were very friendly and helpful. Only negatives were that the bed might need replacing soon. Being an older home the keys and locks were a little tricky. Just wonderful. The apartment is lovely and comfortable and the view and location are amazing. The host is friendly and responsive. We had a perfect stay and will be booking again!